A mini book box packed with toybox friends! Revisit the colourful world of the Toy Story film in six fun-filled mini books. Perfect for pre-schoolers, this Little Library introduces a host of first learning concepts, from shapes, colours, opposites and numbers to objects and actions. 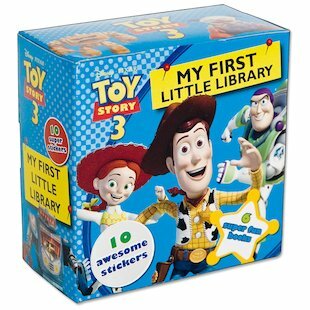 Inside, you’ll find all the favourite characters from the movie – Woody, Buzz, Jessie, Rex and many more. Read the books, then flip them over to complete a fun picture jigsaw! Includes a sticker sheet.